A useful tool for recreating that old vintage sounding saturation and valve-style distortion in the mix. Can subtly thicken sounds. Provides a good degree of distortion. Solidly built. 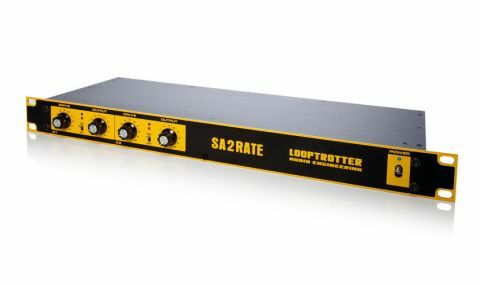 Drawing it's inspiration, sound and build from Looptrotter's Satur-8 solid-state saturation circuit, the SA2RATE repackages it in a smaller, more affordable box. Relax, it has nothing to do with Del Boy... Looptrotter Audio Engineering is a Polish company which has products available here in the UK through KMR Audio. Although a relatively new kid on the block, you might know it though previous bumblebee coloured hardware releases such as the Monster compressor and the Satur-8 analogue summing mixer. "What you are getting with the SA2RATE appears to be pretty much two of the Satur-8's channels in a single 1U rackmountable box"
The Monster compressor featured a valve saturation circuit, and the Looptrotter team says that they used that as a reference to create a distinct valve sound using solid-state technology for the Satur-8's Drive feature. SA2RATE builds on the legacy of what's gone before, but puts it in a setting more likely to appeal to those who don't want to shell out for the company's larger products (what with the mighty Monster and Satur-8 units looking to run you the best part of two and a half grand). What you are getting with the SA2RATE appears to be pretty much two of the Satur-8's channels in a single 1U rackmountable box and it is designed to provide saturation and soft limiting with some of the flavour of vintage valve consoles and classic analogue tape machines. The SA2RATE gives you a choice for connectivity with rear-panel inputs and outputs on both XLRs and 1/4" jacks. Operation is very simple - you connect the unit to an insert point or in-line with your sound source and its destination, switch the processing on with each channel's on/off switch and then tweak the audio with its Drive knob, the appropriate output level being set with its Output knob. The Drive knob sets the saturation depth and, while anyone using the unit would be obviously using their ears to monitor the effects, there are also a pair of red LED's per channel that indicate just how much processing is taking place. One LED will light up when you have 4% Total Harmonic Distortion and a 1dB gain reduction while both lit up indicates distortion of 8% and 3dB of gain reduction. "Towards fully clockwise you can start to really dirty things up with a sound not unlike the harmonic distortion you'd get from valves"
Advancing the Drive control on the SA2RATE initially brings in a very subtle warming/thickening of the sound and you can dial in something of the flavour of driven analogue tape with its touch of compression. Further on, towards fully clockwise you can start to really dirty things up with a sound not unlike the harmonic distortion you'd get from valves. The overall effect will of course vary from instrument to instrument and the end result that you are trying to create, but there's plenty here that can usefully enhance sounds whether tracking or mixing. In use, an average level of Drive, without getting into distortion territory, helped sit some backing vocals nicely into the mix and good results were had on individual drums - a healthy dose of Drive will give you extra whump on a kick drum and you can add some useful crunch to insipid drum loops. While a touch of Drive added some character to a DI'ed electric guitar, you may find the full distortion from the unit a little fizzy compared to an overdriven valve amp, but it can work well on other instruments - transforming certain synth sounds and adding grind and growl to bass guitar. The perceived lack of 'warmth' in digital recording compared to using vintage valve gear and analogue tape has seen a demand for products that can provide more of that flavour, and there's plenty of plug-ins around that aim to offer it. However, if hardware is your thing, the SA2RATE could be a worthwhile addition to your rack to add a little of that mojo for a fat sound and a little distortion if needed.